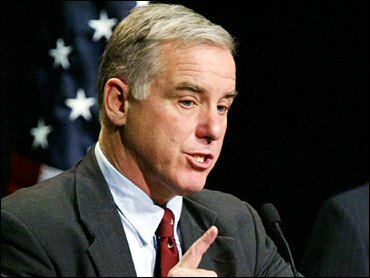 Former Vermont Governor Howard Dean has pulled away from the field in the Democratic Presidential nomination race: his support among Democratic primary voters nationwide has risen in the past month, and held steady after the news of Saddam Hussein's capture. But the race remains open: more than half of Democratic voters still have no opinion of Dean, most have not made up their minds for sure, and large numbers remain undecided. Dean has been a vociferous critic of the Iraq war. Most voters believe, as Dean does, that the U.S. is no safer from terror in the wake of the arrest of Saddam Hussein. And while Dean's rise may have been helped along by former Vice-President Al Gore's recent endorsement, most primary voters say Gore's nod makes no difference to them. Dean has the backing of 23 percent of likely primary voters, the same as he did in the days just prior to Saddam's capture, and up from 14 percent in November. His nearest rivals today are Wesley Clark and Joe Lieberman, both at 10 percent. Dean's rise between November and now seems to have come partly at the expense of Congressman Richard Gephardt -- whose 6 percent support today is down from 12 percent last month -- and to a lesser extent from Senator John Kerry, who has fallen to 4 percent nationally from 7 percent last month. But in a sign the race could still shift, the number of voters who do not have a candidate choice has also grown, up to 28 percent today from 23 percent one month ago. AFTER SADDAM'S CAPTURE, THE TERROR THREAT IS…? Democratic primary voters are less likely than all registered voters to say that the war in Iraq, or removing Saddam Hussein, has been worth the costs. They are also less likely than voters as a whole to say that the U.S. efforts to rebuild Iraq now are going well, following Saddam's capture. Just under half of primary voters say the U.S. effort is going well following the arrest, while 66 percent of all American voters describe it that way. Nearly three-quarters of Democratic primary voters who back a candidate today say it is still too soon to say if their choice is final, and just 25 percent say their mind is made up. This is slightly less certainty than there was in December of 1999: when the 2000 Democratic nomination fight was about to begin, 29 percent of those Democratic primary voters had made up their minds between Al Gore and Bill Bradley. With just over one month remaining before voting begins in the Iowa caucuses, most of the candidates vying for the Democratic nomination still do not elicit much response, either good or bad, from many primary voters. Joe Lieberman, the party's Vice-Presidential nominee in 2000, is the best known, and he also has the highest favorable rating. 37 percent of Democratic primary voters hold a favorable view of him. Over half -- 56 percent -- of primary voters do not see Howard Dean either favorably or unfavorably; this includes nearly one in three who have not heard much about him at all. Lieberman received increased attention and favorability in the days following Saddam's capture. Before the capture, Lieberman had a 25 percent favorable rating and 58 percent had no opinion of him; in the days following, Lieberman received a 37 percent favorable rating while 44 percent had no opinion of him. Among all registered voters nationwide, Dean's favorability drops to 20 percent, while more -- 25 percent -- view him unfavorably. Gephardt and Kerry are also viewed more negatively than positively among all registered voters. Lieberman and Clark's favorability ratings are lower among all registered voters, too, but their overall standing remains mostly positive. Lieberman is viewed favorably by 27 percent of all voters and negatively by 24 percent; Clark is viewed favorably by 17 percent and negatively by 16 percent. But voters are not paying any more attention to the campaign now than they were a month ago: 21 percent say they are paying a lot of attention, and four in ten are paying it some attention. Dean's rise over the past month is apparently not only the result of Al Gore's endorsement -- though the former VP's nod has helped. One in five Democratic primary voters says they are more likely to back Dean for the nomination as a result of the endorsement, though the vast majority says Gore's support makes no difference to them. DOES AL GORE'S ENDORSEMENT MAKE YOU…? Gore's endorsement had a similar effect on Democratic voters' general feelings about Dean; most voters said it made no difference, but where the endorsement did have an impact, it was positive. HAS AL GORE'S ENDORSEMENT MADE YOU…? Gore is seen favorably by most -- but not all -- Democratic primary voters: 52 percent hold a favorable view of him, but 21 percent hold a negative view of their party's 2000 nominee. Among all American voters, Gore does less well: 31 percent of voters nationwide have a favorable view of him, and 46 percent have a negative view. This is lower than Gore's favorable ratings following the 2000 campaign; in November of 2000, Gore was seen favorably by 41 percent of voters. If Dean does go on to win the Democratic nomination, 42 percent of all registered voters today say they would consider voting for him in the General Election in November, but 40 percent say they would not consider it. Currently, most Democrats would consider backing Dean, while 42 percent of Independents and 14 percent of Republicans would. Democratic primary voters are not necessarily looking for a candidate who opposed the war in Iraq -- in fact, many say the nominee's stance on the war would not matter to them. 31 percent want the party's nominee -- whoever he or she might be -- to have opposed the action in Iraq. 27 percent want a candidate who supported it, while more than one in three -- 37 percent -- say the candidate's war stance doesn't matter to them. There was less desire for a nominee who opposed the war after the capture of Saddam: in the days prior to the capture, 40% wanted such a candidate. Only 21% of Democratic primary voters would like to see a nominee who supports gay marriage, while more than one-third would prefer the nominee oppose it. 41% say the candidate's stand on this issue would not matter to them. Democratic primary voters prefer someone who has Washington experience to someone who does not: 26 percent want a nominee whose experience is mostly in Washington, while 16 percent want a nominee from outside Washington. But more than half, however, say it would not matter. Upbringing could matter more. More than two-thirds of Democratic primary voters believe that political leaders who grew up middle class do a better job of representing middle-class interests than do leaders who grew up wealthy. 21 percent say those who grew up wealthy can represent the middle class just as well. Among all voters, 61 percent think people who grew up middle-class can better represent the middle class. WHO BEST REPRESENTS MIDDLE-CLASS PEOPLE? Many voters don't want to hear too much about the candidate's personal life, however. Nearly half of Democratic primary voters said that political candidates, in general, spend too much time discussing their personal lives: 47 percent think so, while 37 percent say the time spent on such topics is about right. Overall, 52 percent of voters hold a favorable view of the Democratic Party, and 54 percent hold a favorable view of the GOP, about the same way things stood just before the 2002 midterm elections. Whoever the Democratic nominee is, he or she will lead a party that is currently seen as better able to create new jobs, but not necessarily better able to create a strong overall economy. Despite the passage of Medicare reforms by President George W. Bush and a Republican-controlled Congress, the Democrats are still seen as better able to lower the cost of prescription drugs for the elderly. But the Republican Party is overwhelmingly seen as better able to deal with terrorism and handle the rebuilding of Iraq. The December 14-16, 2003 poll was conducted among a nationwide random sample of 857 adults interviewed by telephone, including 716 registered voters and 290 Democratic Primary Voters. The error due to sampling could be plus or minus four percentage points for results based on the entire sample. The December 10-13, 2003 poll was conducted among a nationwide random sample of 1057 adults interviewed by telephone. The error due to sampling could be plus or minus three percentage points for results based on the entire sample.